How do you make one character stand out from another? Delineation! That’s when one character is described in such a way as to make him/her unique to the narrative. 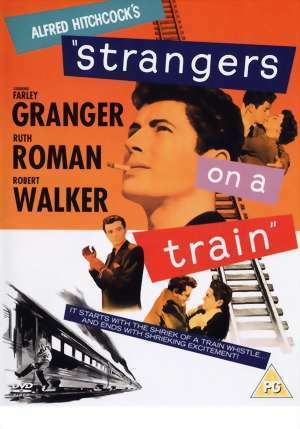 Alfred Hitchcock was a master at delineating his characters, and in Strangers on a Train, he does just that with his two leads Bruno and Guy. If you’re going to have a bad guy, how can you make him bad without making him just mean or antisocial? If you’re Alfred Hitchcock, you use humor. In this film about two strangers who meet…can you guess??? 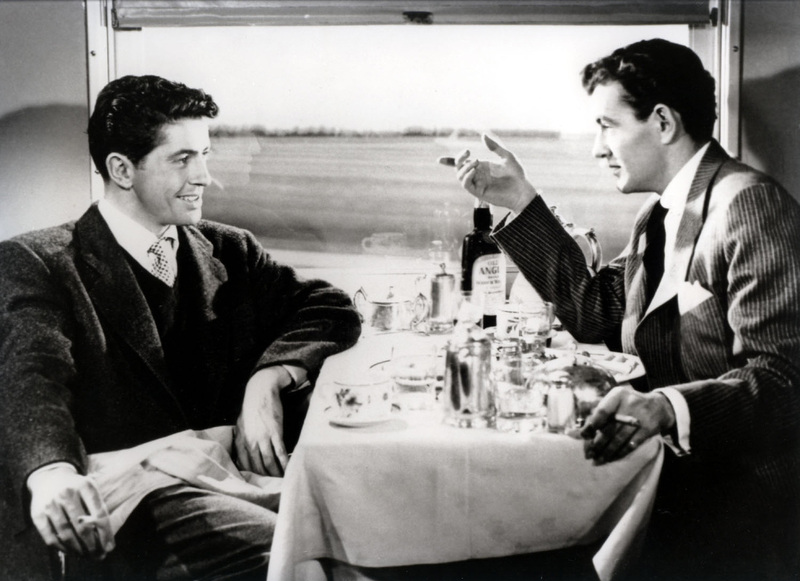 …on a train, one (Bruno played by Robert Walker) is a complete psychopath and the other (Guy played by Farley Granger) is a tennis star in a bad marriage who has a girlfriend and wants to leave his wife. After a conversation is struck, it is reveled they both have someone they’d like to be rid of. Guy is just musing while Bruno is in earnest about heir “Crisscross” murders. In the beginning, Bruno is simply annoying and a little pushy and obviously socially awkward. Guy is accommodating out of his social etiquette, but is obviously only half paying attention to the things Bruno is speaking about. To Guy it’s all very hypothetical. The delineating comes in several spots. One great example of how we know for sure Bruno is the bad guy, even though Guy has jokingly said he wanted his promiscuous wife dead, is when Bruno is at the carnival and a kid walks up to him with a balloon in one hand and a play gun in the other and he pretends to shoot Bruno. 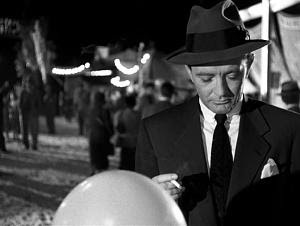 As the boy passes Bruno pops the kid’s balloon with his cigar. It’s funny, but it tells us everything we need to know about Bruno’s character. 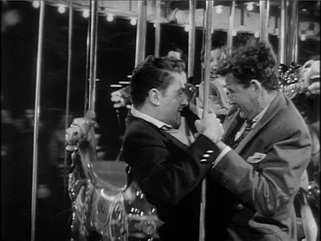 Near the end, it’s Guy and Bruno on an out-of-control carousel, and Guy actually saves a kid from falling off. Guy’s wife is delineated as deserving to be killed by being the one who cheated on her husband to the point where she informs him she is pregnant, but it’s not his child. Right before she is killed, so goes through the Tunnel of Love with TWO men. I’m sure this would have been shocking in the 1950s and Guy’s new girlfriend is delineated by being a Senator’s daughter, very high class as well as elegant and classy. Bruno about to pop a kid's balloon. Bruno is further delineated from “sane” people at a dinner party where he once again strikes up a conversation with an elderly woman whom he gets to talk about killing her husband and how she would do it. In the scene Bruno almost chokes the poor woman to death and then passes out. Slowly through these subtle delineations the audience can see that Bruno is a class above the usual killer…he’s completely insane. The scariest delineation of all, though, is we also see how clever Bruno is in his plotting. That’s what makes him powerful and frightening. 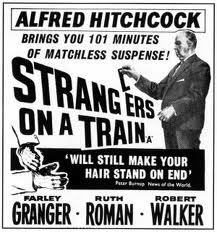 This film was based on the book by Patricia Highsmith…her first novel in fact and Hitchcock got the rights for a whopping $7,500! Describing things in such a way as to make them unique.